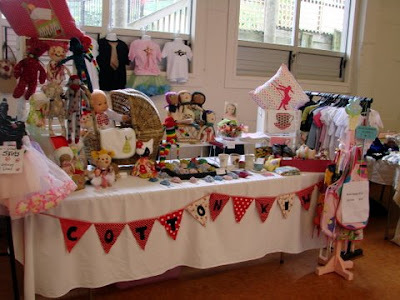 Poor Maddy was really ill over the weekend and it was really hard to leave her at home to go and run the market on Sunday. She was full of a nasty cold that was giving her really high fevers too. It's so horrible to see your children ill. Maddy suffers from asthma too and I never get any sleep when she is sick because I panic that she will suffer an attack that I won't know about. I always bring her to bed with us and lie awake or doze until her breathing settles. Richard of course did a sterling job of looking after her on Sunday but it was still hard to leave her when she was so ill. Poor man. Just what he wanted to do on Fathers Day. We're having a Father's day celebration for him next Sunday to make up for his missed day. No, you're not seeing things. 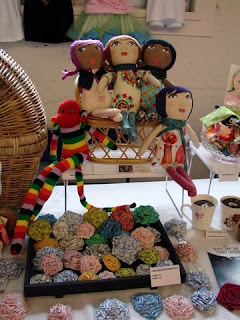 Those are Jennie from A Little Vintage's Dolls who were making a guest appearance on my market stall on Sunday. It's funny how many people recognised them as they walked past and made a comment about them being in the wrong place. Hopefully Jennie will be back at the market next month, but if she isn't, her dolls will more than likely be available on my stall again. Anyway, back to Maddy. She still wasn't quite right yesterday so she had a day off school. She had spent most of the weekend lying on the couch watching movies and was totally over that, so I had to come up with something else to entertain her. Luckily, the lovely and extremely talented Sarah of Dolls and Daydreams, had given us one of her totally awesome eco dolls house kits. 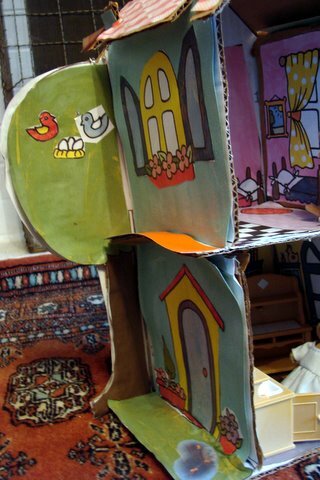 We had so much fun putting it together. Eloise was a little too keen to have a go with the parcel ripper I was using to cut out the cardboard box and I had to make sure I put that way out of her reach when I left the room! I did let them loose with the scissors for all the cutting out of the print-out rooms and they had a ball sticking them on. I have to say, it was pretty hard not to reposition everything they stuck on and the house does look a little wonky, but hey, its all their own work and they love it! Check out that awesome chandelier! 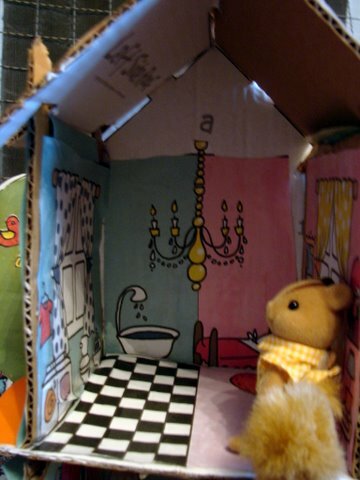 We ordered some little wooden dolls from Sarah and they arrived in the post today so the plan is to decorate those next and evict the Sylvanian Squirrel families from the house. 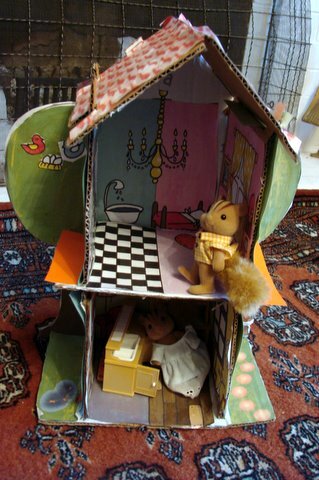 Don't worry, the squirrels have an entire pink princess castle and vintage fisher price dolls house to move into. Maddy is much better today thankfully but still looking a little grey around the gills. Fingers crossed she'll be back to her normal self soon! What a fabulous house!! 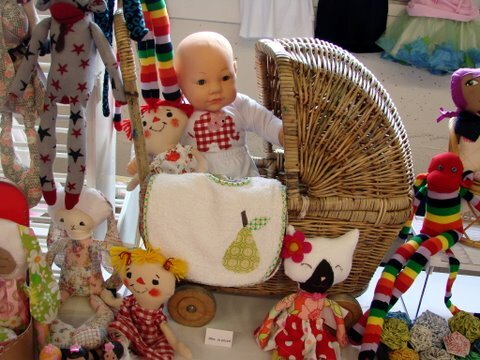 I hope your little one is better very soon & that this Sunday is a lovely fathers day for you all.. There are some nasty bugs going round at the moment - hope Maddy is feeling better today - and at last the sun is out - yippee!! What a gorgeous little house! I'm glad she had fun making it with you, and hope she is better soon. My son is home sick, there are so many nasty bugs going around right now. I feel the same way when my daughter gets sick. I can't sleep because I'm worried about her. I hope your daughter is feeling better soon!!! By the way your stall looks great. 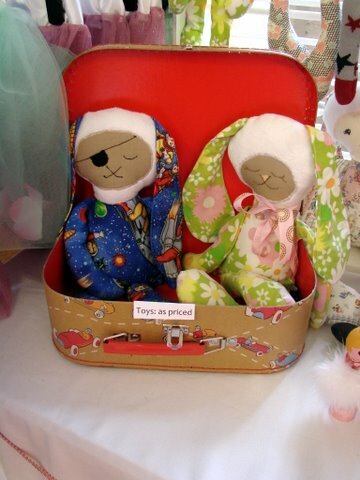 I love the little bunnies in the case. They are adorable!